Our DIY Doorway Puppet Theatre was inspired by a beautiful puppet theatre I saw on Pinterest via Craft, made by the Crafty Cupboard. 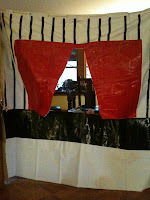 I had never thought of having a doorway puppet theatre and loved the idea but the Crafty Cupboard is a much better sewer then I, so I had to come up with another way of making a doorway puppet theatre. Instead of fabric I used a white shower curtain liner, you can get them lots of places and they are usually very cheap, I paid a little more for a heavy duty liner and it cost me $2.99. 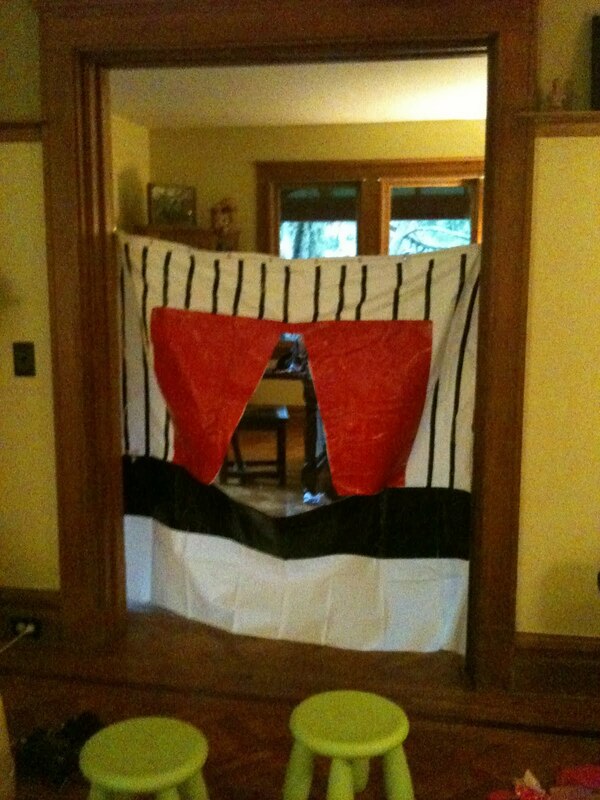 To add the curtains and designs I used duct tape and electrical tape, both of which I already had. To Make the Puppet Theatre I begin by laying the the shower curtain out on the floor and drawing in pencil where I wanted the curtains to be. Then using a pair of scissors I cut out a piece from the middle and along the bottoms of the curtain so we could open them a little more. 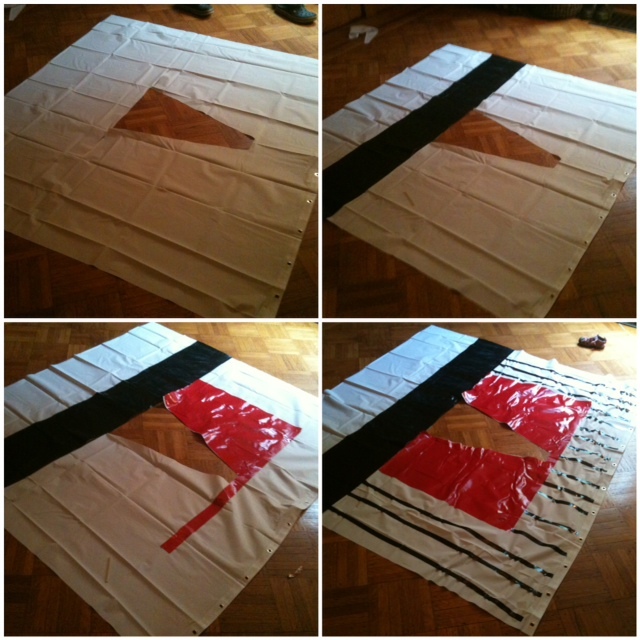 Next I used long strips of black tape to create the stage and red tape along the curtains. To add a little decoration I ran lines of thin black electrical tape in the background to make a pinstripe pattern. I then took two 3M hooks, the kind that you can put up and easily remove and hung them at the right height in the jam of the doorway. I ran a rope through the metal grommets at the top of the shower curtain to tighten and strengthen the top. You could also use the rope to hang the whole thing but I found that the metal grommets fit perfectly over the hooks and held the theatre up better then the rope. The whole project only took me about 30-45 minutes to make. 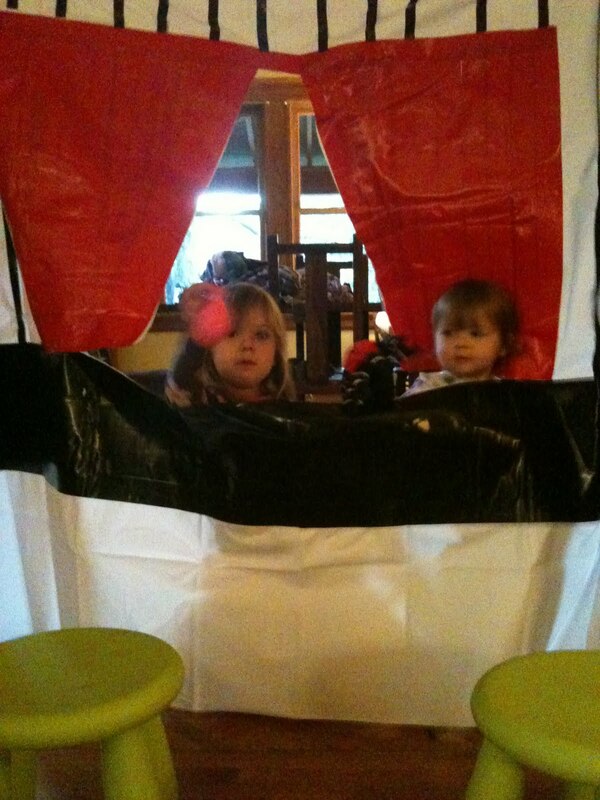 We got out some puppets and the Bee and The Bean had a great time putting on shows and playing peek-a-boo through the curtain. The best part is that when they are done I will just fold it up, and stash it away for another rainy day. So our next project will have to be making some puppets, anyone have any good puppet project ideas? 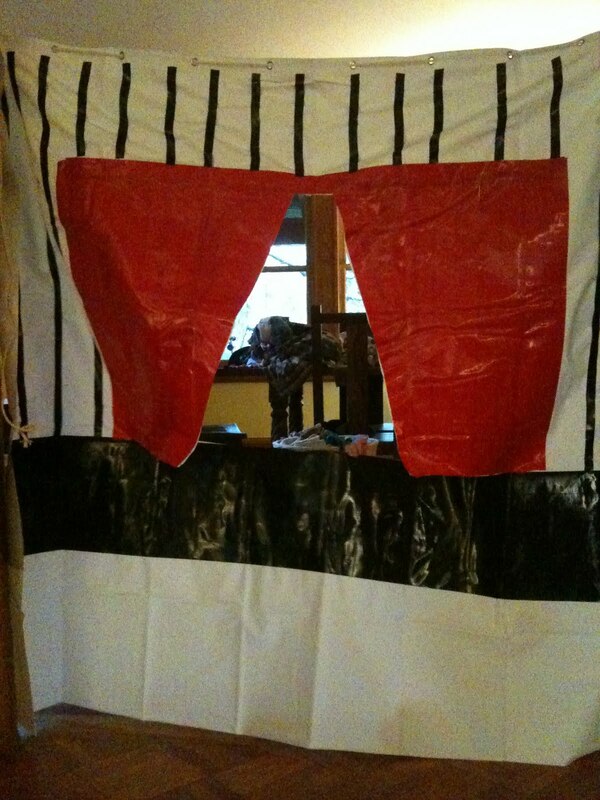 This is a wonderful no-sew version of a doorway puppet theatre. Not only that, your construction with the stripes and colors you used is so nicely designed. Wonderful! Cute! I love that space-saving idea!